Cixin Lui writes incredibly imaginative fiction, exploring vast ideas and bringing them down to a human level. His Remembrance of Earth's Past series has won awards and brought much deserved recognition, with the first in the series The Three Body Problem even becoming a favourite of Barack Obama. Ball Lightning is a new story that as the name suggests, deals with that uncommon natural phenomenon. It's been translated by Joel Martinson, who also worked on the sequel to The Three Body Problem, The Dark Forest. Chen's parents were incinerated before his very eyes by Ball Lightning. He becomes obsessed and dedicates his life to learning all he can about this strange phenomenon. The more Chen learns, the more he comes to realise that unlocking the mysteries of Ball Lightning open up a whole new frontier of particle physics. However It isn't until he meets army major Lin Yun that his research really takes off. I love how much research and energy Lui puts into his stories, he becomes an expert of the subject and Ball Lightning is no exception. Lui goes into the latest research at the time it was written (while this translated work is the newest of Lui's work to be published, it was first written in 2004) in this little known and even less understood phenomenon. He then carries that forward into what it might be, delving into the realms of quantum mechanics. Throughout the book he takes time to examine the practical, real world implications, which of course do interupt the pace but provide fascinating distractions. Ball Lightning is a captivating subject, for those who don't know its an atmospheric electrical phenomenon which displays as floating orbs from pea-sized up to several metres. These orbs are thought to eventually explode (often with danger to any nearby), leaving behind a smell of sulphur. They have been known to float randomly, pass through solid objects and have been seen in thunderstorms and calm weather. Until the 1960's scientists didn't even believe Ball Lightning existed, despite many witness reports. Even now there is little real scientific data on the subject, in part due to it's rare occurance and difficulty to replicate in lab conditions. Most information we know about the subject has been taken from eye witnesses, which vary greatly in accuracy, reliability and consistency. Theories as to just what the phenomenon is vary as greatly as the witness reports, from a condensed form of highly excited atoms to primordial black holes making their way through the cosmos. The book is less conventional than most, while it does have characters and a plot with a beginning middle and end, these are less important than the science, the discovery and the ideas these provide. It's a celebration of science and research, although there is also the age-old argument at play - "just because you can do something, doesn't mean you should". Mindless pursuit of science can have grave consequences for humanity. 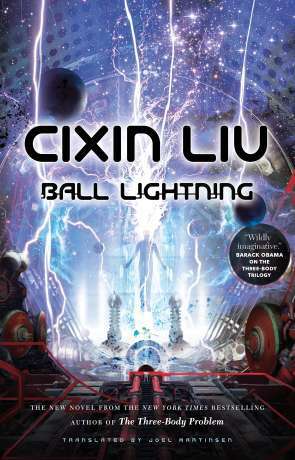 Ball Lightning is powerful, imaginative fiction, a remarkable excercise in scientic exploration and the pursuit of knowledge. Written on 3rd September 2018 by Ant.